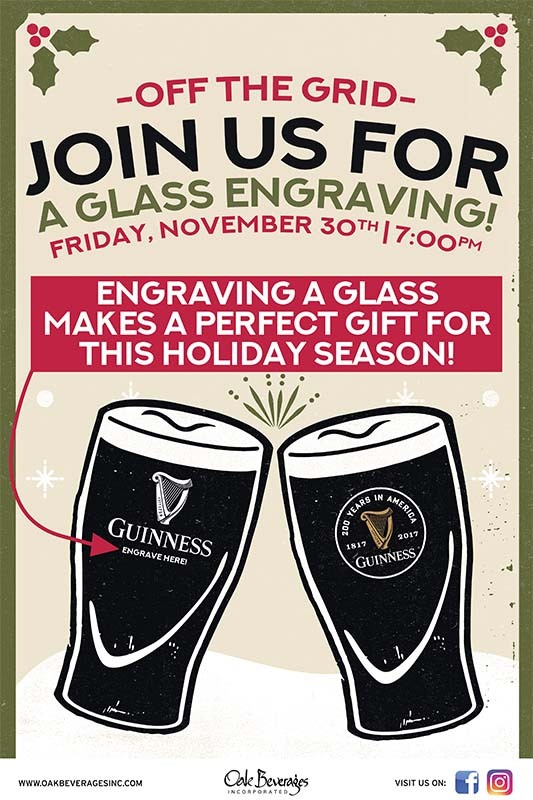 Off The Grid Pub Host Guinness Glass Engraving - Oak Beverages Inc.
Off The Grid Pub Host Guinness Glass Engraving Event, Friday, November 30th, 7pm. Join us for a perfect pint of Guinness then get it Engraved! Engraving a glass makes for a perfect gift this holiday season! Located in the historic neighborhood of Harlem, NYC, Off the Grid Pub & Grub is a purveyor of Mexican-American cuisine, craft cocktails and beers, and a truly relaxed atmosphere. Opening in February 2017, Off the Grid Pub & Grub was created with the basic idea of covering the neighborhoods need for a place they could call home, have a drink, eat, and build friendships with the people they see every day on the local streets. A sense of community, built through the common denominator of being in a judgement free zone. An “off the grid” zone.